The Date Field is used to accept data based on calendar dates. Date on open of question will automatically pull in the date of the device. This allows you to give a hint to help people answer a specific question. This will be displayed below the field, on the device. A default answer provided by you, placed in the question field. This text can be removed by the user. 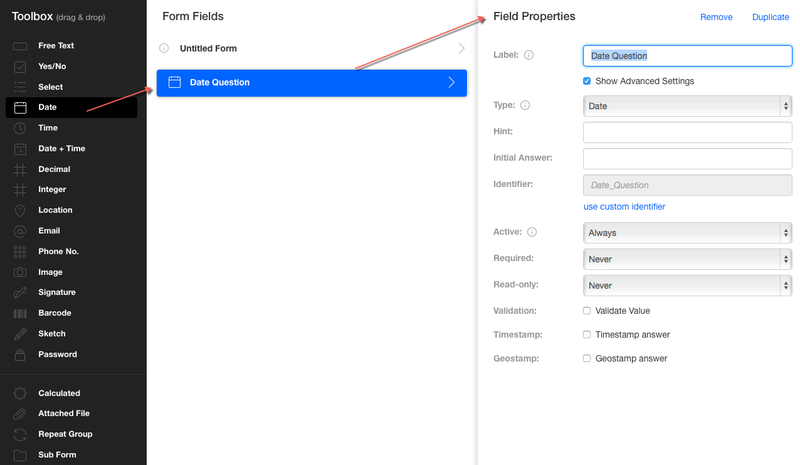 How the field is identified in the form (the name of the field). You can also provide custom identifiers for long questions, to simplify template creation. Even though longer identifiers take up more space on the template, the data pertaining to that placeholder may not use all the given space and could possibly throw your template out of bounds. Allows you to set a rule so as to ensure the question is answered according to a particular condition. You are also able to set an error message so as to indicate to the person how they went wrong with their answer and what they need to do in order to correct it. Records down the time the question was answered. Records down the location where the question was answered.